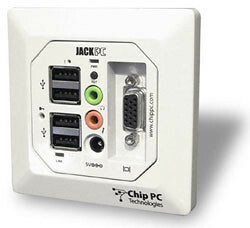 This socket is actually an entire PC that includes a VGA port, 4 USB ports, an audio and a microphone port. The CPU is an AMD RISC processor which is the equivalent of a 1.2GHz Intel processor. And get this: this computer is so energy efficient that it is powered solely over ethernet! If they could squeeze in a decent hard drive it would pretty much be the ultimate "desktop"